Mr. Christopher James Williams was appointed a Non-Executive Director on 19 July 2006 and became Deputy Chairman of the Board with effect from 9 March 2010. He currently serves as a member of the Nominating Committee and the Remuneration Committee. He was last re-elected as a Director at the Annual General Meeting held on 28 April 2017. Mr. Williams is a founding partner of Howse Williams Bowers, Hong Kong, which he co-founded in 2012 as an independent Hong Kong law firm. Mr. Williams was responsible in particular for establishing the non-contentious area of the practice. Howse Williams Bowers has subsequently grown to become one of the leading independent law firms in Hong Kong. Prior to co-founding Howse Williams Bowers, Mr. Williams was from 1994 a partner in Richards Butler, an international law firm which merged with the US law firm Reed Smith in 2008 and was throughout this period based in Hong Kong. Mr. Williams is presently a non-independent non-executive director of OUE Hospitality REIT Management Pte. Ltd. (“OUEHRM”) and OUE Hospitality Trust Management Pte. Ltd. (“OUEHTM”). He was also the chairman of the board of directors of OUEHRM and OUEHTM from April 2013 to November 2017. He was appointed as the chairman and non-independent non-executive director of OUE Commercial REIT Management Pte. Ltd. in October 2013, a director of OUB Centre Limited in January 2014, and a director of OUE Lippo Limited in December 2014. Mr. Williams specialises in corporate finance, mergers and acquisitions, direct investment and corporate restructurings and reorganisations. He also advises on corporate governance and compliance. His practice encompasses Hong Kong and the Asia Pacific region, particularly Indonesia and Singapore. He has been named in the Guide to the World’s Leading Merger and Acquisitions Lawyers, published by Euromoney Publications PLC, and the International Who’s Who of Merger and Acquisition Lawyers, published by Law Business Research, as one of the world’s top mergers and acquisitions lawyers. 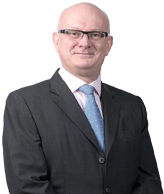 Mr. Williams qualified as a solicitor in England and Wales in 1986 and was admitted as a solicitor in Hong Kong in 1991. He holds a Bachelor of Arts (Honours) in International Relations and Economics from the University of Reading, United Kingdom.